"No Blade of Grass" redirects here. For the film adaptation, see No Blade of Grass (film). 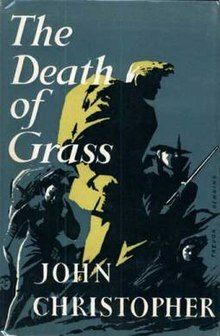 The Death of Grass (published in the United States as No Blade of Grass) is a 1956 post-apocalyptic science fiction novel written by the English author Samuel Youd under the pen name John Christopher. It was the first of several of post-apocalyptic novels written by him, and the plot concerns a virus that kills off all forms of grass. The novel was written in a matter of weeks and liberated Samuel Youd from his day job. It was retitled No Blade of Grass for the US edition, as supposedly the US publisher thought the original title "sounded like something out of a gardening catalogue". The film rights were sold to MGM. A new virus strain has infected rice crops in East Asia causing massive famine; the virus is also revealed to be found in the UK but because of its selectivity does not affect the country's agriculture. After the introduction of a new pesticide, developed in preference to breeding resistant crops, a new, mutated virus appears and infects the staple crops of West Asia and Europe such as wheat and barley—all of the grasses (thus the novel's title). It threatens a famine engulfing the whole of the Old World, while Australasia and the Americas attempt to impose rigorous quarantine to keep the virus out. The novel follows the struggles of engineer John Custance and his friend, civil servant Roger Buckley, as, along with their families, they make their way across an England which is rapidly descending into anarchy, hoping to reach the safety of John's brother's potato farm in an isolated Westmorland valley. Buckley, having advance warning of the government's plot to hydrogen bomb major cities, alerts Custance to evacuate. Picking up a travelling companion in a gun shop owner named Pirrie after an attempt to procure arms, they find they must sacrifice many of their morals in order to stay alive. At one point, when their food supply runs out, they kill a family to take their bread. The protagonist justifies this with the belief that "it was them or us." By the time they reach the valley, they have accumulated a considerable entourage as a result of their encounters with other groups of survivors along the way. They find that John's brother is unable to let them all in to the heavily defended valley. Pirrie prevents John from only taking only his immediate family into the valley; instead, the group takes the valley by force. Pirrie and John's brother are killed; John takes possession of the valley. A dramatised version was broadcast on BBC radio in the late 1950s. A film adaptation, No Blade of Grass (1970), was produced and directed by Cornel Wilde. In 2009, as part of a BBC Radio 4 science fiction season, the station broadcast a drama in five episodes, based on the novel and narrated by David Mitchell. ^ Robert Macfarlane, "Introduction" in John Christopher (2009). The Death of Grass. Penguin. ^ "The Death of Grass - BBC Home Service Basic, 29 April 1957". BBC Genome Project. Retrieved 26 July 2017. ^ "Woman's Hour Drama - The Death of Grass". BBC. 2 March 2009.